Solid sterling silver cufflinks in a simple leaf shape with a satin finish each set with a single AAA lustre black freshwater pearl on a solid sterling silver fixing. 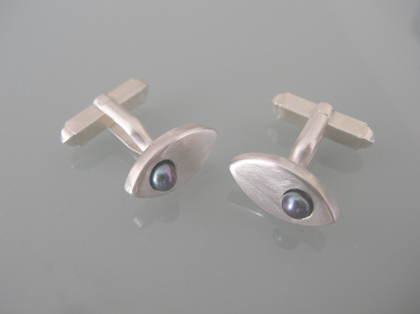 The cufflinks are approximately 1.8cm long and each cufflink is individually hallmarked. This is currently out of stock but can be made to order - please contact me.